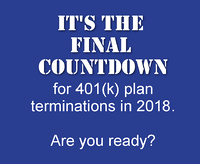 As we enter the 4th quarter of 2018, many plan sponsors – for a variety of reasons – are faced with the prospect of a 401(k) plan termination. For most, this will be the first -- and only -- time that they’ll undertake this important project. If you’re facing a plan termination in the 2018 calendar year, time is not on your side. A properly-conducted plan termination can take up to 2-3 months from start-to-finish, and requires significant planning, flawless execution and lots of attention to detail. In observance of National 401(k) Day, we’ve compiled three unique 401(k) “hacks” – simple but clever tips for managing your retirement savings more easily and efficiently. As has happened so many times before, the Baby Boomer generation is once again drawing attention to an unmet need: a seamless way to consolidate their collection of retirement accounts into a single account, which is a necessary step to creating a sturdy retirement plan. Much has been written about how sponsors can improve both their plans’ overall health and their participants’ retirement outcomes by embracing roll-ins; nonetheless, the account-consolidation process remains time-consuming and expensive for most participants. Retirement Clearinghouse (RCH) is pleased to offer a three-part series of educational videos on plan terminations, presented by Mike Wilder, RCH’s Vice President of Client Services. These videos are intended to provide plan sponsors with a basic understanding of key plan termination process steps, the common mistakes that are made by plan sponsors, and the key criteria for selecting a plan termination services provider. We hope you’ll find these videos interesting & informative! 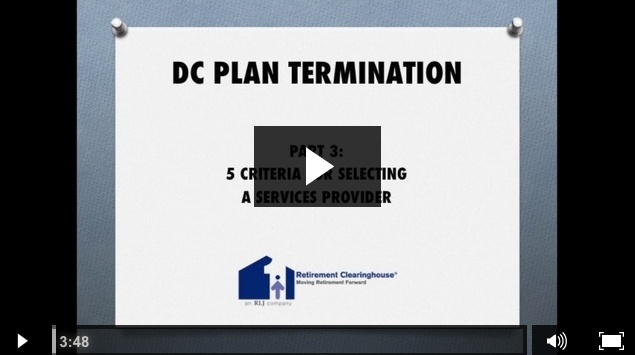 Retirement Clearinghouse (RCH) is pleased to offer the first educational video of a three-part series on DC plan terminations, presented by Mike Wilder, RCH’s Vice President of Client Services. These videos are intended to provide plan sponsors with a basic understanding of key plan termination process steps, the common mistakes that are made by plan sponsors, and the key criteria for selecting a plan termination services provider. We hope you’ll find these videos interesting & informative!